A Pakistani Christian woman who spent eight years on death row for blasphemy has been freed from jail after an acquittal that triggered Islamist protests. 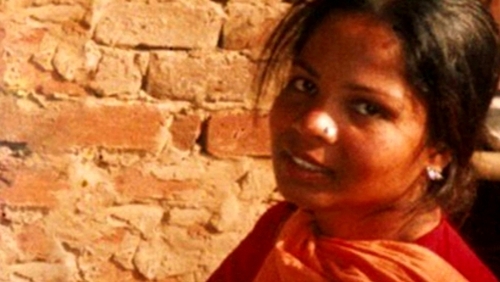 Asia Bibi’s conviction was overturned by the country's highest court last Wednesday, but she remained in prison as the government negotiated with hardliners who blockaded major cities and demanded her immediate execution. Islamist parties had already vowed to take to the streets of Karachi later to protest her acquittal and numbers are now expected to swell sharply following news of her release. "She has been freed," lawyer Saif-ul-Mulook said in a text message to AFP. "I have been told that she is on a plane but nobody knows where she will land." Following protests at last week's ruling, the government agreed in a deal with Islamists to impose a travel ban on Ms Bibi, and not to challenge an appeal in the Supreme Court. Foreign ministry spokesman Muhammad Faisal denied media reports that she had left the country, telling AFP: "She is in Pakistan." An order for her release arrived yesterday at the jail in the central city of Multan where she was held. Another civil aviation official, in Multan, said a small plane arrived in the city with "a few foreigners and some Pakistanis" on board to collect Ms Bibi. The conviction stemmed from a 2009 incident when Ms Bibi was asked to fetch water while out working in the fields. A local imam then claimed Ms Bibi insulted the Prophet Mohammed. Ms Bibi has consistently denied the charges, and her prosecution rallied international rights groups, politicians and religious figures.